There's been a subtle and quiet marketing campaign going on over the past few months for a new tablet maker. All we knew at the time was that the company's name TabCo and they were working on a tablet. TabCo held a press conference today and revealed themselves to be Fusion Garage, the scummy developers who cheated TechCrunch out of the Crunchpad back in 2009. 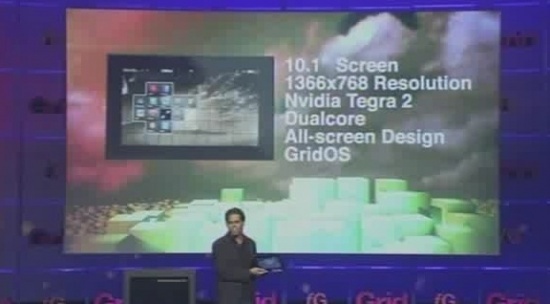 They also revealed their new device, a custom 10" running a new OS called GridOS on a NVidia Tegra 2 CPU. Fusion Garage are boasting the highest resolution on a tablet at 1366x768. The Grid 10 will cost $499 and $599 for 3G and Wifi, “advanced” headphones included, all supposed to be available on fusiongarage.com now and it's scheduled to ship on 15 September. It cleared the FCC a few weeks back, in case you're interested. Fusion Garage also just announced a Grid Phone 4. It's got a 4" screen and it's supposed to stay in sync with your Grid10 tablet. It's coming out in Q4. Folks, the past behavior of Fusion Garage makes it clear that they are the kings of bait-and-switch.This is not a company to do business with.